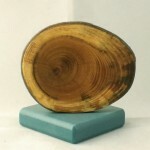 WoldStand Displays are unique, sanded and polished wooden pieces using mostly fallen or surgically removed wood from the Finger Lakes in New York. The variety of woods available will change but some examples are Silver Maple, Yew, Australian Pine, and Oak. 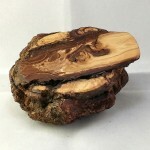 Our most interesting pieces are cut from knots and burls. Knots when cut out well from where limbs broke free and grew over are really interesting pieces. 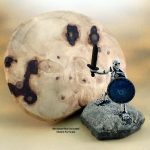 Burls are tree-cancer growths or the results of an injury or parasite growths and they create remarkable patterns within the wood and can be quite impressive for display bases. Branch Collars are the spot where a branch conjoins with the main trunk or larger branch and the ones we get are usually spaces where a branch fell from the trunk it was attached to. The rings and ridging in the middle are raised as the bark grows over the fresh wood creating some interesting terrain. 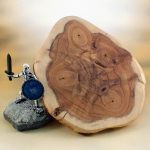 The marbling pattern found in some wood pieces comes from the burl which can be a "cancer" of the tree, an injury or results of parasite growths like fungus and such. 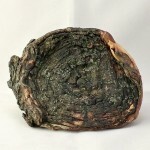 The exterior of burls have lumps and crannies and when finished can be a very interesting display base. 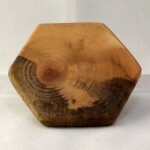 An unusual category, where the artificer specifically and carefully, made a hexagonal shaped base. Bets are ongoing as to whether they play Catan or not. Sometimes a thing doesn't fit into a proper category so there needs to be a place for these oddities. In this case odd usually refers to the shape of the piece, but I am sure I can find other odd wood pieces that defy categorization. Ovals are just rounds that have grown larger over time and spread. 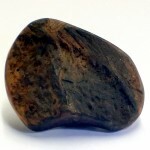 You can typically see the smaller round in wood rings of the oval. 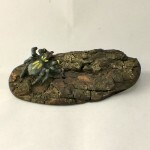 The reason they are their own category is strictly a function of footprint on the game board or comparison to the miniature you want to place on the piece. Plinths are typically finished tall pieces of wood, resin or stone that come round or square. 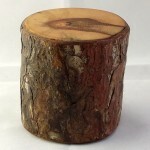 Our plinths are larger sections of tree limbs and average two to six inches around and two to six inches high. 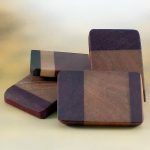 Rectangular pieces have cut from natural wood to be the size of cavalry bases. 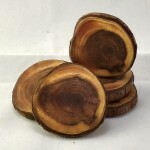 Rounds are typically branches, usually with the bark still on, cut into disks about 1/8 in (6mm) to 1/4 inch (12mm) heights then sanded, finished and polished. 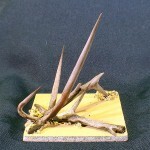 The wood for these will very. 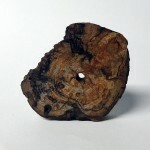 They can also be lathed rounds from various woods, some even glued together, sanded smooth with no bark left.